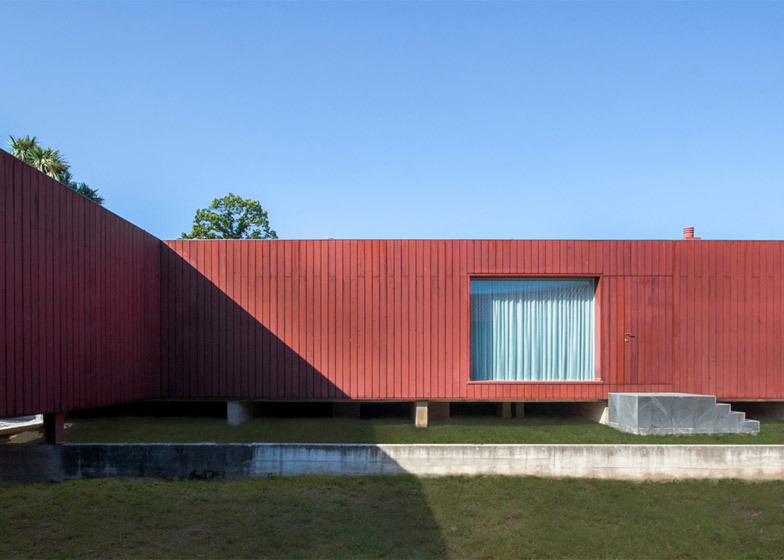 This red-painted timber-clad extension was added to the rear of an old stone farmhouse in Portugal, framing a new courtyard at the centre of the family home (+ slideshow). 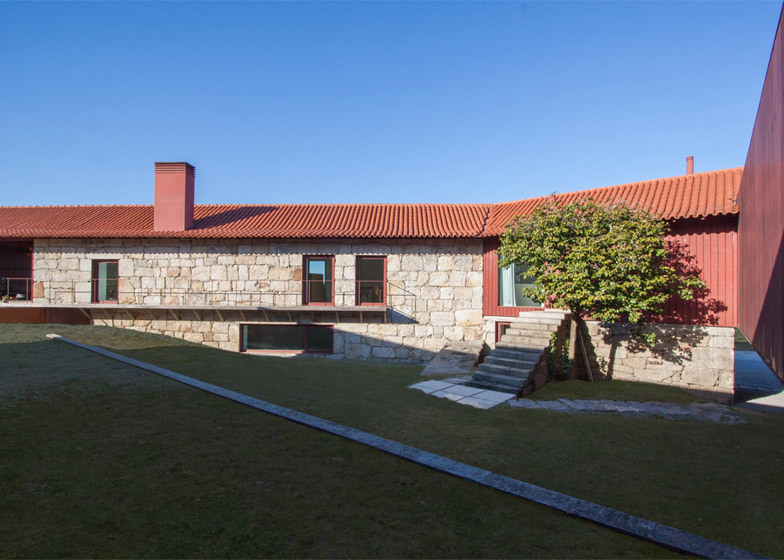 Portuguese studio Pitágoras Arquitectos designed the extension as part of its renovation works to an old stone farmhouse with a terracotta tiled roof called Quinta da Laje. 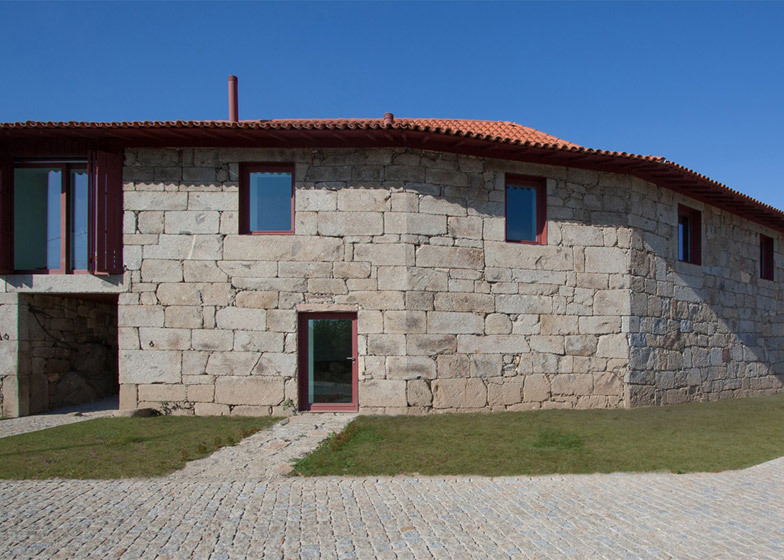 It is located in Felgueiras, a rural district of the Porto region in north-west Portugal. 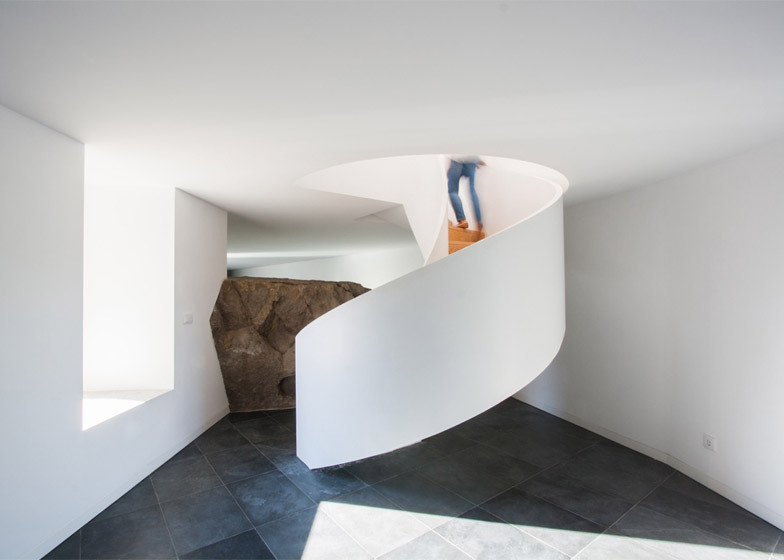 The architects added a spiral staircase with curving white balustrades to the existing stone structure, connecting a tiled lounge and double garage to a kitchen and dining room on the upper floor. 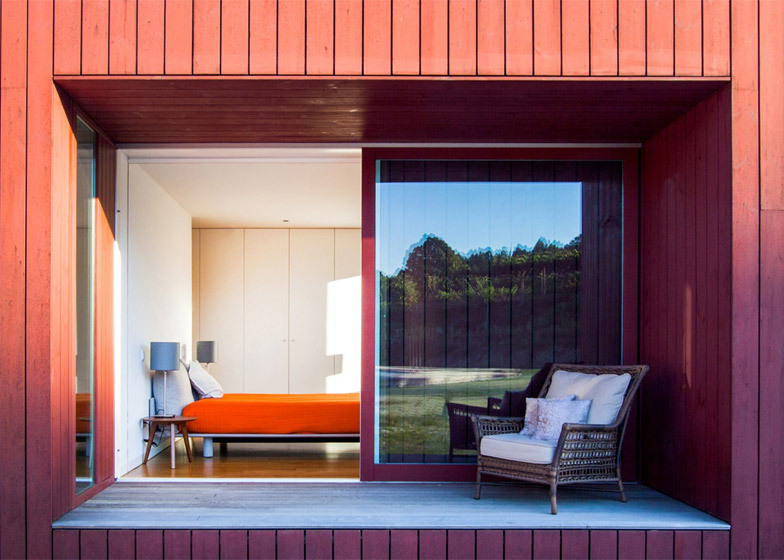 Bedrooms are located in the new timber-clad addition at the rear. 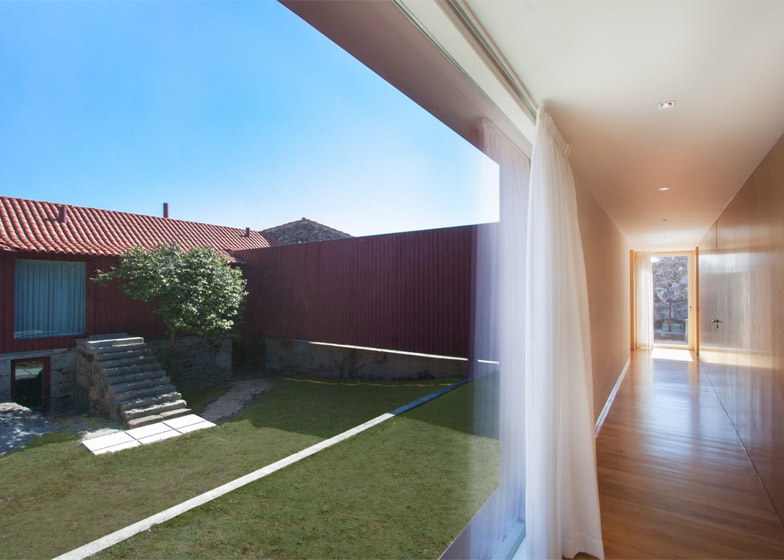 A narrow timber-clad corridor connects the new and old blocks, creating an L-shaped plan that shelters a sloping courtyard. 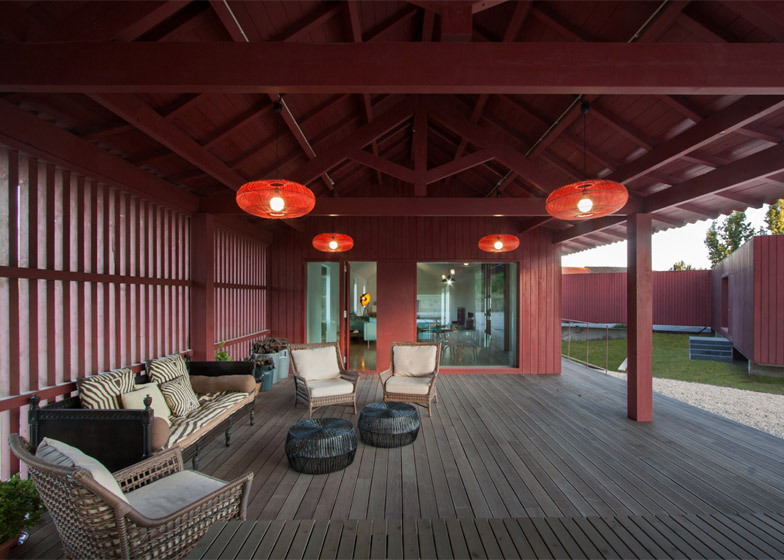 A decked seating area faces this courtyard, and both this and a swimming pool sit alongside the road. 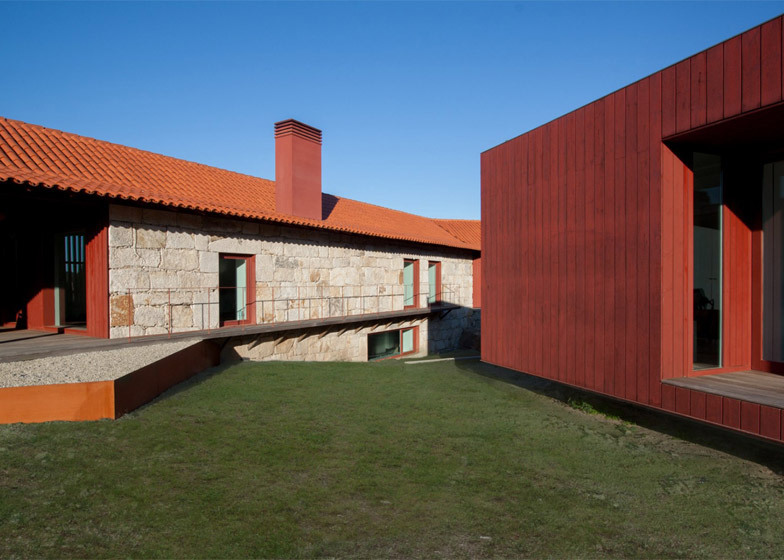 "The idea behind the project was to recover the site of the courtyard, given its position in the tradition of rural constructions and more specifically in the complex in question," explained the architects. 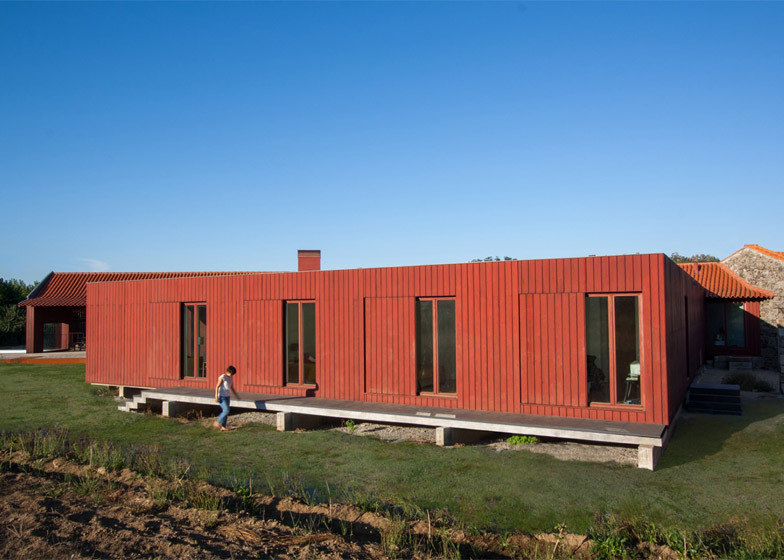 "The proposal consists of recuperating one of the existing constructions – the house – as this determines the frontier between the public and the private space," they added. 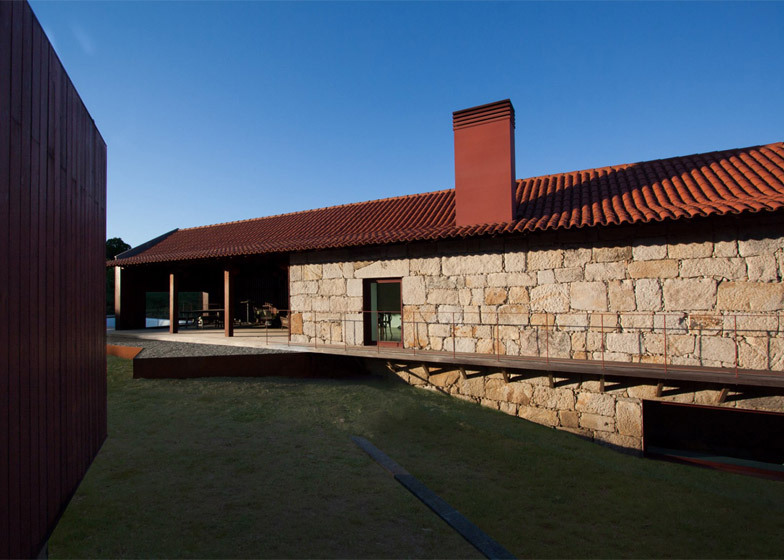 A stone step in the middle of the courtyard accounts for a height difference between the road-facing aspect of the property and higher ground that the extension sits on. 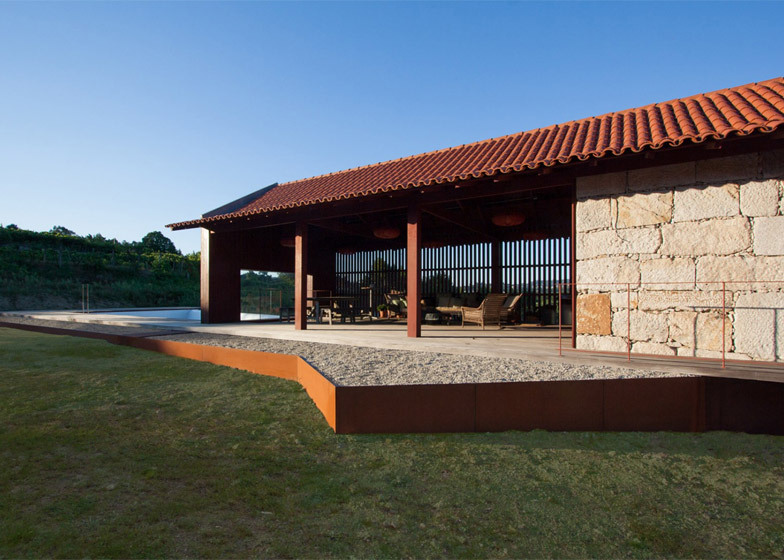 "More than maintaining the features of the past, the idea was to preserve the character of the courtyard," said the team. Storage cupboards are built into the length of the connecting corridor, while glass portholes are set into the warm-toned floorboards. 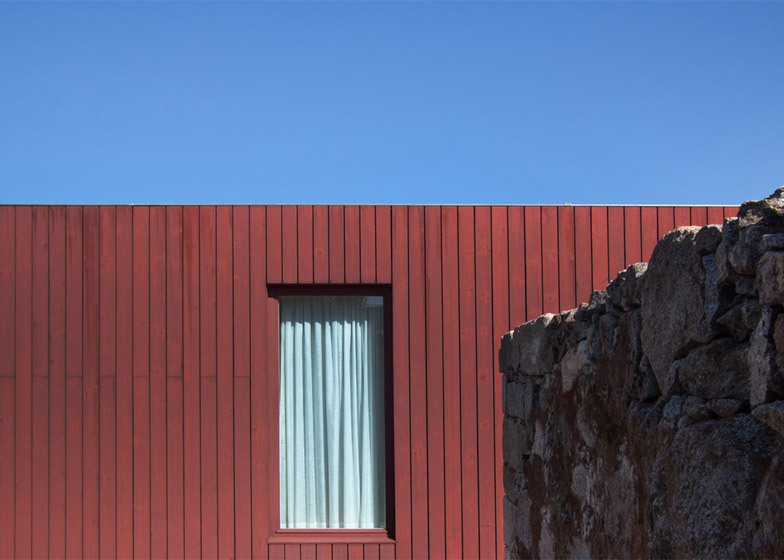 Four bedrooms with en-suite bathrooms are arranged along the inside of the red-painted extension, which the architects describe as being "oxblood" coloured. 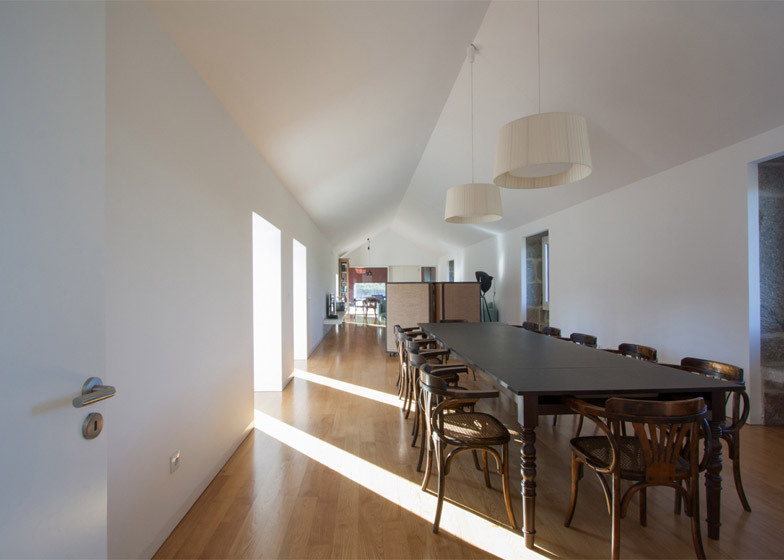 Each room is connected along an enclosed corridor, which leads down into the courtyard. 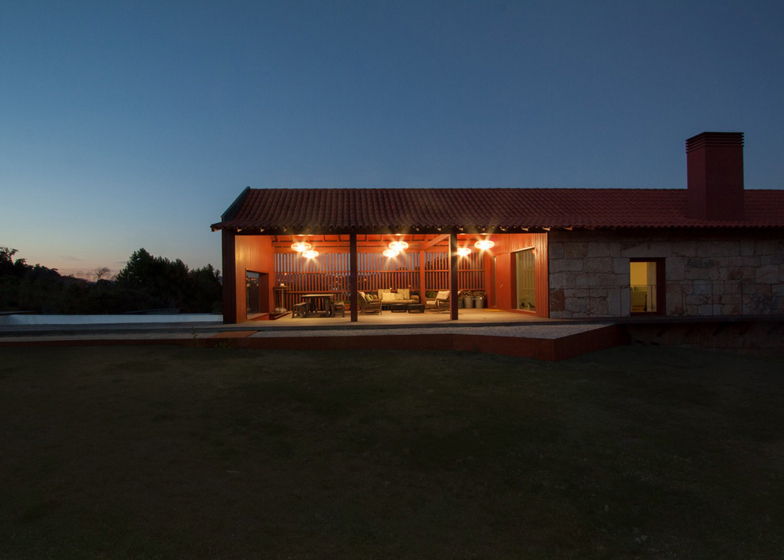 There is also a more secluded veranda that faces agricultural land to the rear of the site. 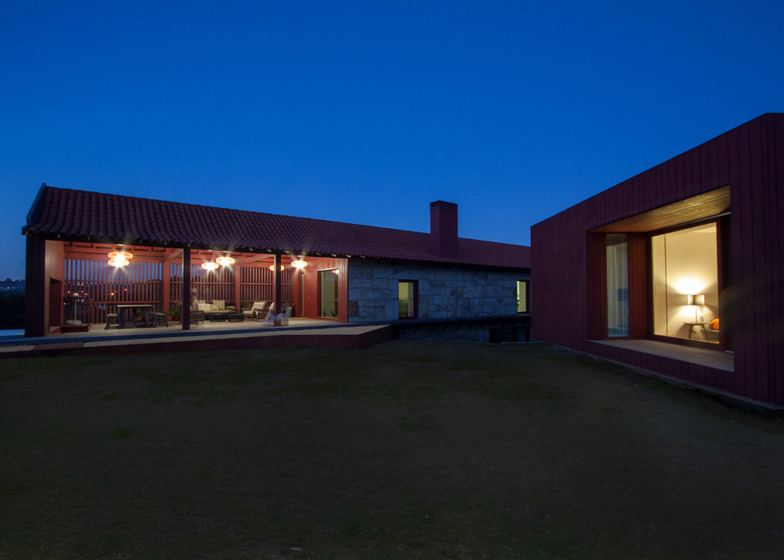 Photography is by Pitágoras Arquitectos.